Sign up for Broadjam today to follow Paul J Penton, and be notified when they upload new stuff or update their news! Paul J Penton is one of Australia's exiting new breed of craft based songwriters. After years of intensive study with Berklee Music College, seminars with Berklee legend Pat Pattison, and hit songwriter Jason Blume as well as Nashville #1 writer Steve Seskin and Grammy winning Producer Steven Webber, Paul J Penton's songs are beginning to reflect the maturity of his studies. 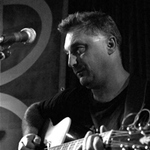 Paul won the Jazz/spoken world Category @ the Australian songwriting Conference in 2009. And has 3 cuts on a forthcoming release by Australian Artists Ron Sellars.